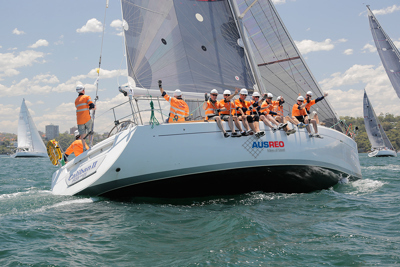 The crew had a performance to remember in the 2017 Sydney Gold Coast Yacht Race, winning IRC div 3 and finishing second ORCi in div 2 – and are determined to push forward in the 2018 Rolex Sydney Hobart. “We’re so excited about having another crack at Hobart, we spent the national debt on preparing the boat this year,” skipper Ian Creak says. “We want to go hard and get some crystal this year. I have a bit of extra space on my desk!” This year’s team includes many family ties with father-son duos, Douglas Sturrock from Sturrock’s chandlery next to the CYCA, and mountain climber Andrew Lock. Even with some notable crew members onboard, “Individual effort is important, but it’s teamwork that makes the dream work,” Ian Creak explains.